In 65 Goalkeeper Training Exercises, goalkeeping coach and educator, Andy Elleray, offers fellow football coaches a way of training that takes keepers from the confines of the goal or penalty area, into new, challenging, and fulfilling settings. Games-based goalkeeper training is an alternative to the traditional goalkeeping curriculum and combines physical, psychological, technical, tactical and social skills in small situations that keepers will face in matches. These include 1v1s, communicating with the defence, decision making, shot stopping, and more. Games-based training is about using games and activities drawn from football, selected sports, physical education, sports science, and other spheres, to help progress keepers with the skills they will really need in competitive match situations. Aimed at readers who coach goalkeepers at all levels, from junior level to elite standard, the games can be conducted within a variety of playing environments including, in many cases, indoors. Goalkeepers will be working on areas of their game relevant to their position without them even knowing it because they will be made to think quickly and do what comes naturally to them. They will be learning to cope with new and challenging situations in these games and often how to work as a team to win points or solve a problem. Whilst standard technical drills still have a central role to play in goalkeeper development, games-based development aims to offer an alternative to traditional sessions. Much of games-based goalkeeper training is designed for coaches who have a large group of goalkeepers to work with. With large numbers, it is very hard to do small technical practices in goals, because of space constraints and having so many goalkeepers not working. 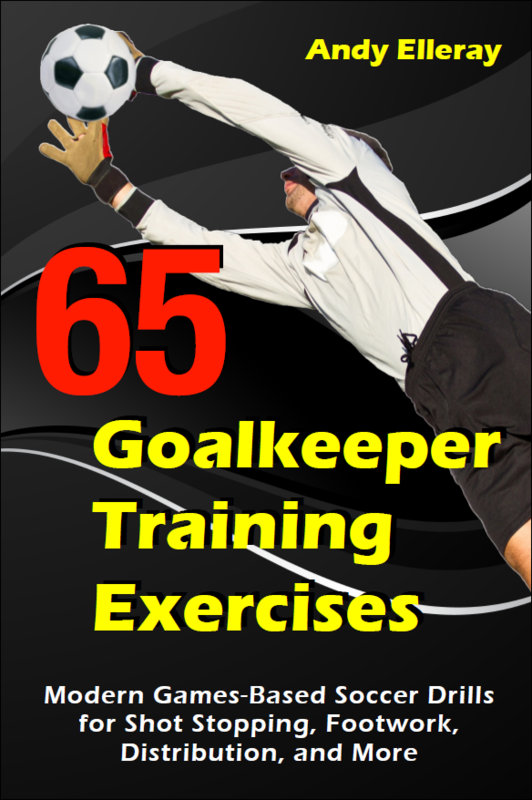 65 Goalkeeper Training Exercises is a must-have addition to every coach’s bookshelf.